SUNNYVALE, Calif. — APRIL 12, 2018 — Illumio today announced new global vulnerability mapping capabilities on its Adaptive Security Platform®. 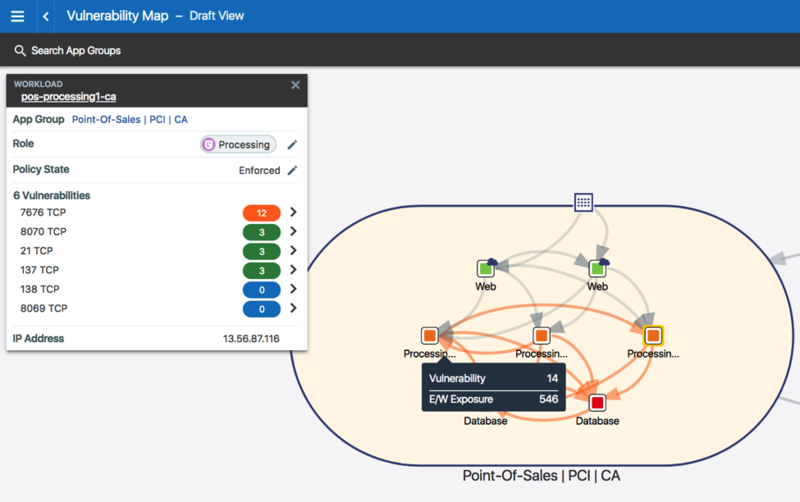 For the first time, vulnerability and threat data from the Qualys Cloud Platform is integrated with Illumio application dependency mapping to show potential attack paths in real time. The integration between the Qualys Cloud Platform and Illumio delivers vulnerability maps, enabling organizations to see connections to vulnerabilities within and between applications. This new capability also includes an East-West exposure score that calculates how many workloads can potentially exploit vulnerabilities on applications. This integration can be used to generate micro-segmentation policies as compensating controls that reduce East-West exposure and to prioritize patching. Software vulnerabilities in applications have been the cause of recent headline-grabbing attacks and data breaches around the world, including WannaCry, NotPetya, and Apache Struts. Meltdown and Spectre are among other recent examples of vulnerabilities where potential exploitation could give attackers access to an environment – or to move laterally within data centers and clouds. Due to the growing scale of infrastructure and software vulnerabilities, organizations are unable to patch every vulnerability and may be unable to patch many critical vulnerabilities due to production freezes or for fear of breaking their applications. Vulnerability map: see vulnerabilities in the context of the application dependency map. 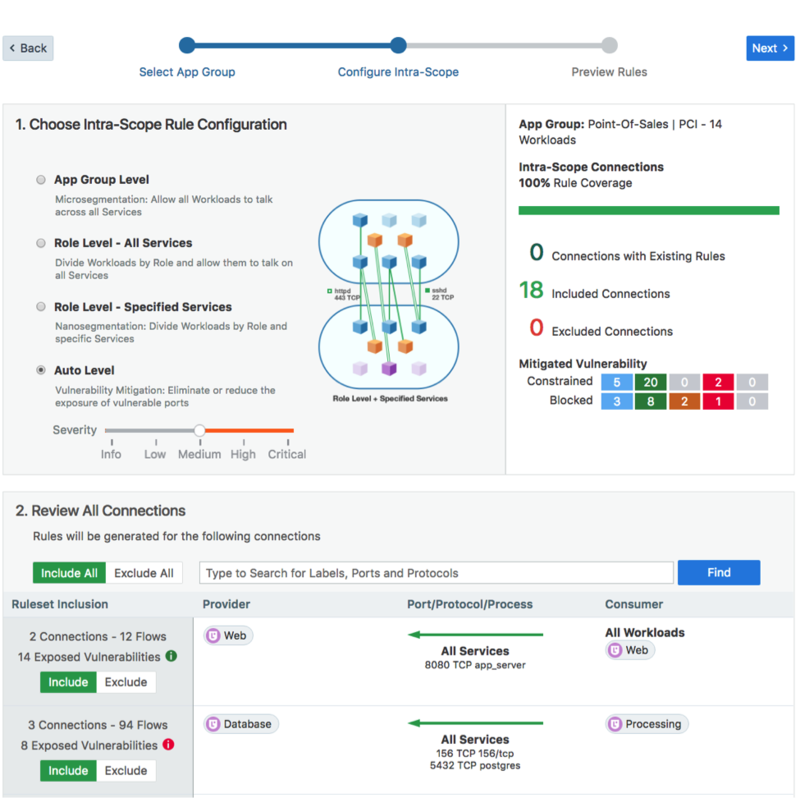 East-West Exposure Score: Using workload, application, and connectivity context, Illumio gives organizations an exposure score for their East-West traffic. The score is calculated based on how many workloads can potentially exploit the vulnerabilities on any given workload. The lower the score, the smaller the chance that a bad actor can exploit it. If patching is not available, the optimal way to reduce exposure is to use micro-segmentation to reduce the number of workloads that can connect to it. East-West exposure score: the number of workloads that can potentially exploit a vulnerability. Automated Policy Recommendations Based on Vulnerabilities: Mitigates vulnerabilities through automatic policy recommendations. The Adaptive Security Platform now ties vulnerability data to application traffic in real time, providing organizations with the ability to use micro-segmentation to prevent the spread of breaches. Automated vulnerability-based policy recommendations: mitigate vulnerabilities without breaking your application. Illumio has maintained a track record of continuous innovation to meet the growing needs of the emerging micro-segmentation market. In 2017, Illumio achieved 300 percent year-over-year bookings growth. This rapid growth is being driven by organizations who are increasingly turning to Illumio to prevent the spread of breaches inside data center and cloud environments and to meet regulatory compliance standards such as SWIFT, PCI, GDPR, and HITRUST. Watch the demos to learn more about vulnerability maps and the Illumio Adaptive Security Platform.